Engine: GM 3.4L V6 with non-feedback GM Varijet carburetor on stock manifold (390 CFM with manual choke). Comp Cams camshaft (#260-H) with Crower lifters, springs, and retainers (kit #84008), and Comp Cams roller rocker arms (#1413-12). Home-made fiberglass air cleaner with cold-air induction. Electrical Mods: converted to GM alternator and 12 Volt negative ground using HEI ignition with remote coil. Tachometer modified for HEI 6 cylinder, and speedometer rebuilt, both by MO-MA in Albuquerque, NM. 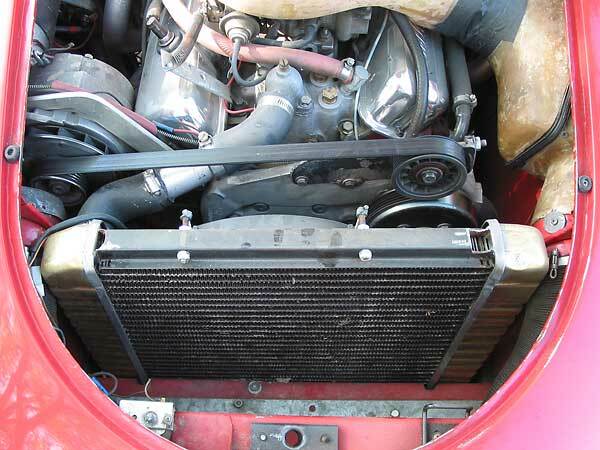 Cooling: modern crossflow radiator mounted on rubber-cushioned brackets just forward of original position. Reserve coolant/expansion tank and over-flow tank, both owner fabricated. Electric cooling fan (pulling). Exhaust: owner fabricated headers, made from a "Headers by Ed" kit. Transmission: Borg-Warner T5 5-speed. Stock Flywheel and pressure plate from a 3.4 liter 1993 Firebird with aftermarket clutch disc, and Howe hydraulic throw out bearing. Master cylinder sleeved to accommodate Howe system. Custom driveshaft by Driveline Services in Boulder, CO.
Rear Axle: stock MGA (4.56:1). Front Suspension: stock MGA with MGB front sway bar. Wheels/Tires: currently using MGA 1500 steel wheels on the front, and MGA 1600 steel wheels on the rear. Body: "LeMans" style front valance from Auto Vintagery in La Jolla, CA. Performance: haven't quantified it yet, but it's quick and "fast enough"! Completed: 1999. Driven about 5000 miles since completed, as of September 2008. Comments: This car has been a project ever since I acquired it as a rust bucket back in 1973. It had had a number of paint schemes already by then, and was finally brought back to stock red in 1995. Then it dropped a valve on the conglomerated 1500cc / 1622cc engine. The conversion process began with a trial 2.8 liter empty block from "Pull & Save". The motor mount and transmission mount system was just an adaptor plate set-up in front, using the stock rubber mounts and an angle iron "extension" with an adaptor to support the tailshaft housing. to line up. I wanted to keep the body looking stock, and that was easy to do by using a carburetor. A throttle body fuel injection system is in the works though, along with a 3:89:1 ratio rear end. The most time consuming part was working out the header system. The left side had to snake around the steering column. It's almost time to do a full re-paint, now that the last of the mechanical issues are almost dealt with. GM 3.4L V6 with a GM Varijet 390cfm carburetor. Cold air induction with a remote box-type air filter. Stock MGA rubber mounts were used with an adaptor plate set-up. GM Varijet 390cfm carburetor on stock manifold. Clever homemade fiberglass air cleaner/induction system. Stock brake and clutch master cylinders, and windshield wiper motor. Fabricated reserve coolant/expansion tank and over-flow tank. Craig Roush shows us his custom-built exhaust headers. LeMans-style front valance from Auto Vintagery in La Jolla, CA. In 1995 the car was brought back to its original color with a new coat of paint. MGA 1500 steel wheels on the front, and MGA 1600 steel wheels on the rear.